Submitted by Alexander Briones on Apr. 2, 2019. First published on August. 16, 2016 and last updated on April 2, 2019. This guide is primarily meant to help beginner guitarists in getting good affordable instruments. And it is also a good resource for experienced players who want a cheap guitar to modify and experiment with. For this 2019 update, we divided the list according to pickup configuration, featuring the best rated entry level guitars that fall under the Single Coil, Humbucker and Mixed pickup categories. 85 out of 100. Incorporating 150+ ratings and reviews. The Epiphone Les Paul SL is the most affordable licensed Les Paul in the market, and it's doing quite well even with big changes in its setup. The most important difference is that instead of humbuckers, this one comes equipped with single coil pickups with basic knobs that let you adjust master tone and master volume. But what it lacks in specs, it makes up with its distinct appearance and colorful finish options. Value for money is the most commended trait of the Epiphone Les Paul SL. While not perfect, many report that while its sound and build quality exceed their expectations. As expected, most of the ratings are from students and beginners, but there are even some experienced guitarists who are impressed with its tone. There are some complaints about the quality of its default strings, while others report tuning stability issues. Thankfully, there are also plenty of users who are satisfied with the guitar after changing the strings and making minor adjustments. Thanks to the Epiphone Les Paul SL, you can now have an officially licensed Les Paul for a very modest amount of money. Those who are looking for a single-coil equipped Les Paul will also find this guitar appealing. 86 out of 100. Incorporating 20+ ratings and reviews. More than 60 years after its first production, the Stratocaster continues to be among the most in demand, and the most copied electric guitar designs on the market. The Squier Bullet Strat HT is its modern representative in the entry-level market, staying true to the original double cutaway profile, albeit using more cost-effective materials and production methods. It is called an HT model because of its Hard Tail bridge, but everything else is as Strat as it gets, with 3 single-coil pickups and a 5-way pickup selector. Many owners are satisfied with the Bullet Strat HT's overall performance, more notably, the way it retains tuning. It receives a lot of positive comments for its build quality, while others are pleased with its in-between pickup tones. A recurring theme among reviews is that this guitar is a great buy, especially for beginners. Most of the complaints are centered on the poor quality of the strings that it ships with. There are also a few users who felt that the color was a bit off compared to the images, but still liked how the guitar performs. 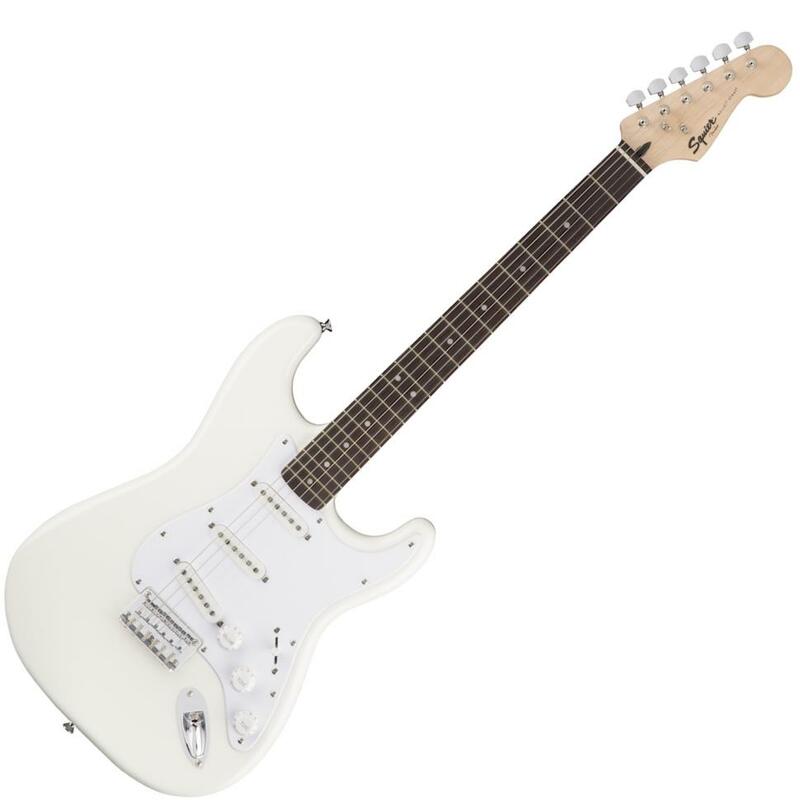 The Squier Bullet Strat HT is an affordable and reliable way to enter into the world of electric guitar playing. 89 out of 100. Incorporating 1500+ ratings and reviews. The Telecaster is the guitar that effectively started the solid-body electric guitar revolution. During the 1930s and 1940s several companies tried to produce a solid-body electric but none of them were commercially successful. Then Leo Fender released his design in 1950 with a single pickup under the name Esquire, then added a second pickup and sold it under the name Broadcaster but soon had to change it due to a lawsuit from Gretsch who were already selling a drum kit using that name. Thus the "Tele" as we know it today was born. 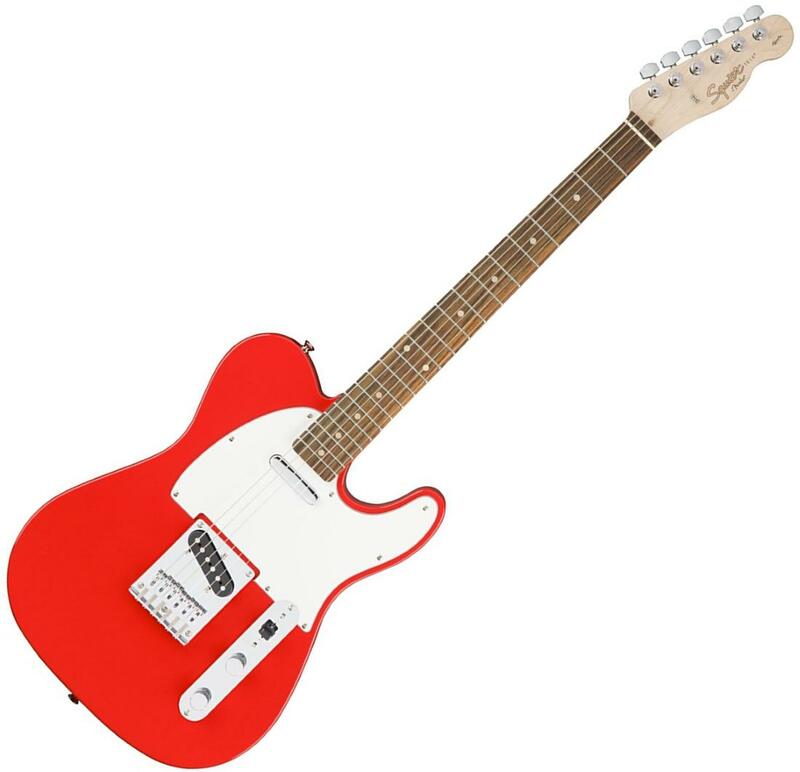 It's hard to overstate how well liked this version of the Tele is by people who have bought and played it - something which is evidenced by its very high Gearank score. Most commendations point to its playability, tone and overall build quality. For something that's continues to sell well, there are relatively very few complaints - most of which are from people who encountered setup and cosmetic issues out of the box. You can't go far wrong with the highest rated telecaster style guitar under $200. 90 out of 100. Incorporating 650+ ratings and reviews. 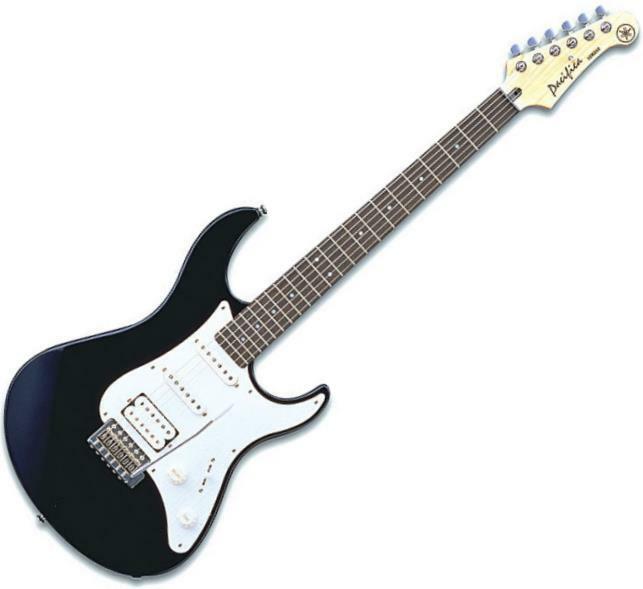 At time of publication, this was the highest rated solidbody electric guitar for under $200. Like many other Japanese guitar manufacturers in the 1960's and 1970's, Ibanez were essentially building copies of American guitars from the likes of Gibson and Fender which led to lawsuits which in turn led to Ibanez needing to come up with their own designs. Then in 1986 they teamed up with Frank Zappa's guitarist Steve Vai to create a new design which led to the JEM and RG series that were launched in 1987 and Ibanez hasn't looked back since. These types of guitars are known as 'Superstrats' because of their obvious body shape similarity to Fender's Stratocasters. The GIO series are their current entry-level guitars with the GRX20Z, combining a superstrat style body with two humbucking pickups, being their highest rated option under $200. This is another budget guitar that is routinely praised for the excellent value for money it provides. Many reviewers point to its playability as its strongest point, which is not surprising given that this guitar is from Ibanez. There were even several people who wrote in their reviews that they liked the GRX20Z so much that they had bought it more than once. Other than a few complaints saying it doesn't stay in tune well enough (similar complaints can be found about all budget guitars) there weren't many consistently stated negatives about the GRX20Z. If you're looking for an affordable shred machine that will help you get your chops up, then get the Ibanez Gio GRX20Z. 87 out of 100. Incorporating 50+ ratings and reviews. The LTD EC-10 is ESP's affordable hotrod version of the classic single-cutaway design. Immediately noticeable is its distinctly contoured body, which smoothens the parts of the guitar that come in contact with your arm, and makes it easier to reach higher frets. Speaking of frets, this guitar has a 24-fret fingerboard on top of a thin U-shape profile neck. Giving the guitar its voice are two LH-100 humbuckers, which are controlled via a 3-way toggle switch, master tone knob and master volume knob. Many users admit that they were initially drawn by its rock guitar appeal. But it's not just about looks, because many appreciate the ESP LTD EC-10's playability, which they describe as very smooth and comfortable. There are also plenty of owners who are impressed with the quality of its hardware, from the wood, to the bridge. Some users comment that changing the strings helped the guitar's intonation and sound. While a few experienced guitarists complain that the tone is similar to other dual humbucker guitars, but this is more of a preference issue. 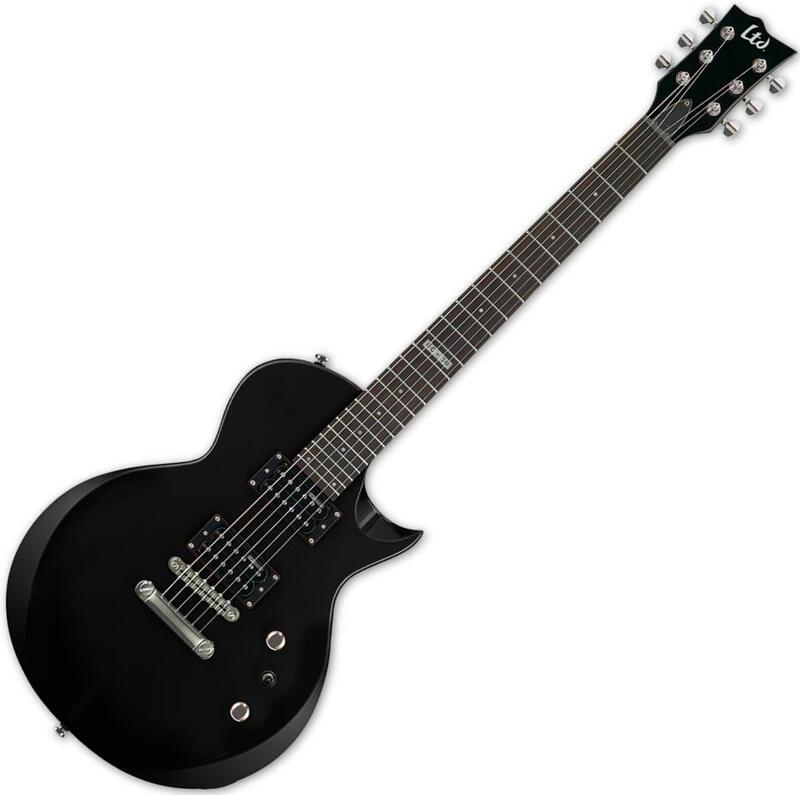 If you're looking for an affordable black guitar that's comfortable to play and ready to rock, then check out the ESP LTD EC-10. 87 out of 100. Incorporating 225+ ratings and reviews. Many of today's super strat guitars owe their staying power to guitar brands like Jackson. With the success of their Soloist model, Jackson helped establish the Super Strat as a distinct guitar category, rather than being a clone. The JS22 Dinky follows after Jackson's tried and tested formula, only this one is more accessibly priced. Noteworthy features include its arched top, dual high-output humbuckers, bound fingerboard and headstock and graphite reinforced neck. Playability is a big factor in why many users are happy with their Jackson JS22 Dinky. Some describe it as smooth and comfortable, while others go so far as comparing it to more expensive guitars. 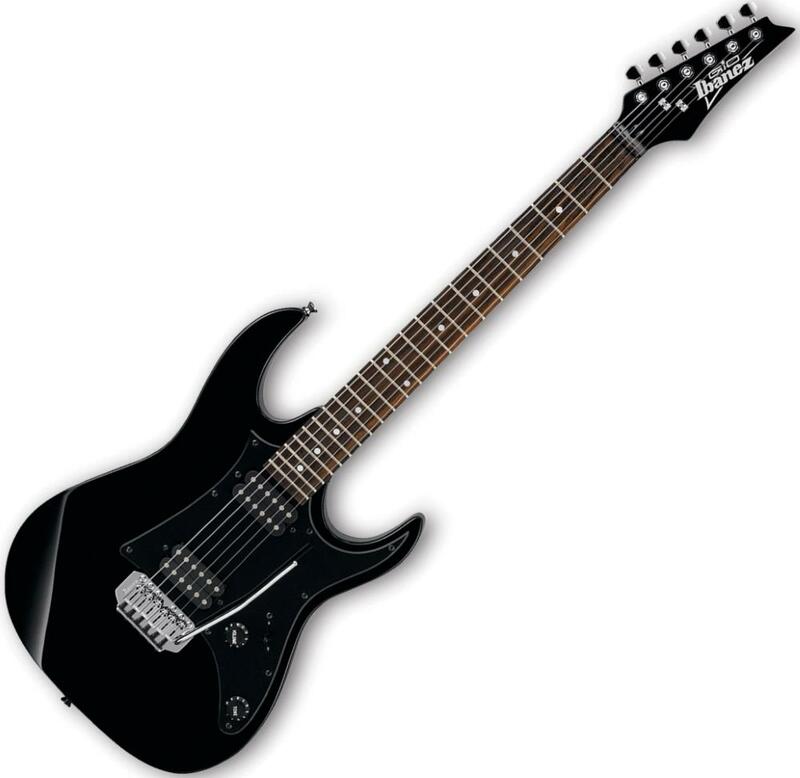 It also gets a number of favorable comparisons to more expensive Ibanez models. Many users are also happy with its build quality. Note that majority of reviewers are either beginners or parents of students. Since it comes equipped with a tremolo bar, some users feel that it would have rated better if it had locking tuners, but this maybe too much considering its price point. There are a some reports of fret buzz and minor cosmetic issues out of the box, but most of the issues are user serviceable. With its shred friendly super strat + tremolo setup, this is a black guitar that is worth considering. 87 out of 100. Incorporating 375+ ratings and reviews. Designed in the US back in the 90's, and manufactured in Japan, the Pacifica Series is Yamaha's take on Fender's two main designs - the Telecaster and the Stratocaster. The Yamaha Pacifica PAC012DLX is sought after because of its very accessible price tag, especially when considering that it sports a super strat HSS configuration, along with Yamaha's brand of student friendly playability and quality. Market opinion continues to be positive, thanks to owners rating this guitar highly because of its overall quality. Most users comment that the PAC012DLX gives you more quality per dollar, while others describe it as a very student friendly instrument. It gets a lot of kudos for its nice sounding single-coil tones, while the humbucker impresses even experienced players. The usual pitfalls of affordable electric guitars are represented in reviews, from minor aesthetic issues, to tuning problems. Thankfully, many users report improved playability and overall experience after setting up the guitar properly. 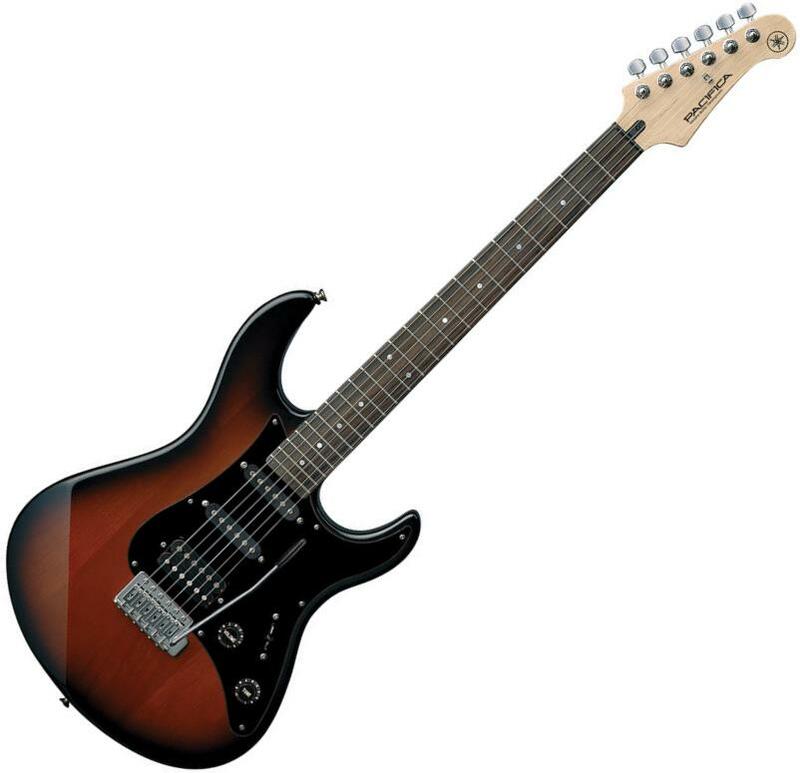 The Yamaha Pacifica PAC012DLX is highly recommended if you want a good quality HSS guitar while squeezing your budget. 88 out of 100. Incorporating 200+ ratings and reviews. The Pacifica PAC112J is the bigger sibling of the PAC012DLX, with the main difference being the use of alder wood for the body, much like classic strats. 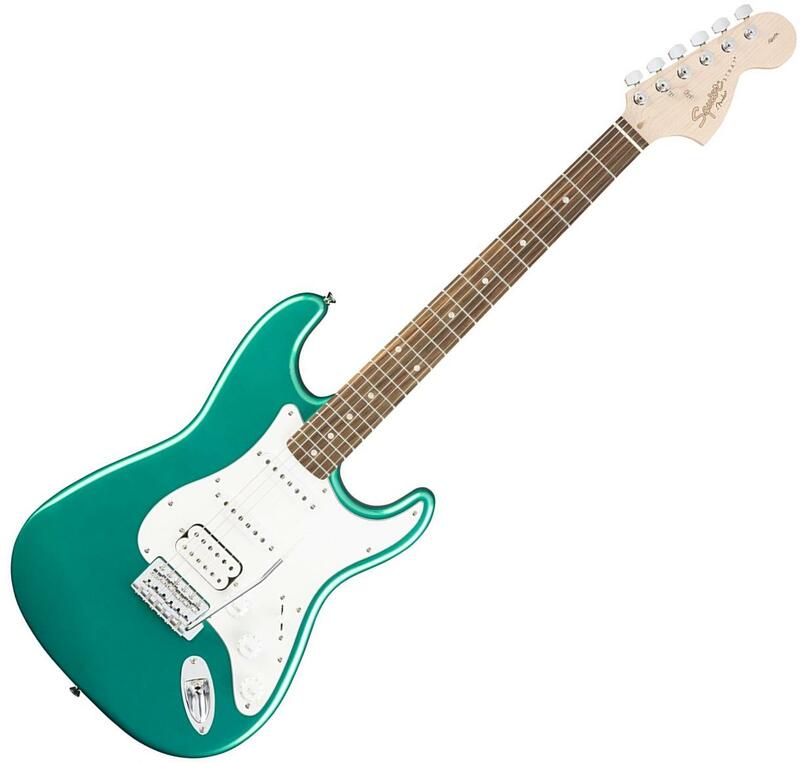 Other than that, it sports the same Pacifica double cutaway shape, strat style neck specs and HSS pickup configuration. Many guitarists favored the Yamaha Pacifica PAC112J over the budget Squire HSS strats in their reviews. They commend its build quality and its tone. 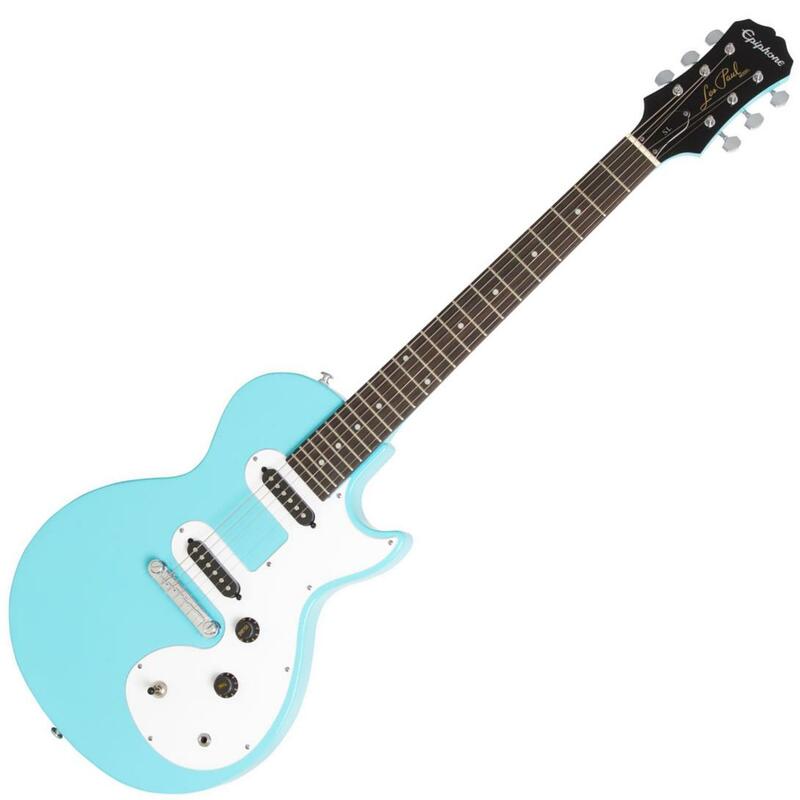 Value for money got repeated mentions, with some going as far as claiming that this guitar plays as well as those priced twice more. There were no consistent complaints about this guitar in customer reviews - just a few of the same negatives about quality and tuning stability that most guitars in this price range get. With its high rating, and Yamaha's reputation for student friendly quality, you can't go far wrong with the Pacifica PAC112J. 86 out of 100. Incorporating 275+ ratings and reviews. Being a sub-brand of Fender, Squier is licensed to build strats, and that that is exactly what the Affinity Series Stratocaster HSS is about, a licensed HSS configuration strat with a down to earth price tag. One noticeable difference is that it retains the two tone knob configuration of classic Strats, allowing for more ways to shape your tone. Aside from that, it follows the tried and tested strat formula of having an alder double cutaway body, maple neck, and vintage-style synchronized tremolo. Reviews are full of positive comments about its tone and playability. The Squier Affinity Series Stratocaster HSS also gets a lot of thumbs of for its finish. Longevity is also reportedly high, with some owners reporting years of satisfied use. Some string action related issues are reported, including fret buzz. There are also a few who are not too happy with the tuners, a common issue found in guitars in this price range. The Squier Affinity Series Stratocaster HSS is still among the most popular HSS strats in this price segment, well worth looking into. The four most prominent electric guitar brands in this price range are Squier (From Fender), Epiphone (from Gibson), Yamaha, and Ibanez. Thanks to their experience and manufacturing capabilities, these brands continue to produce quality entry-level electric guitars of different styles. 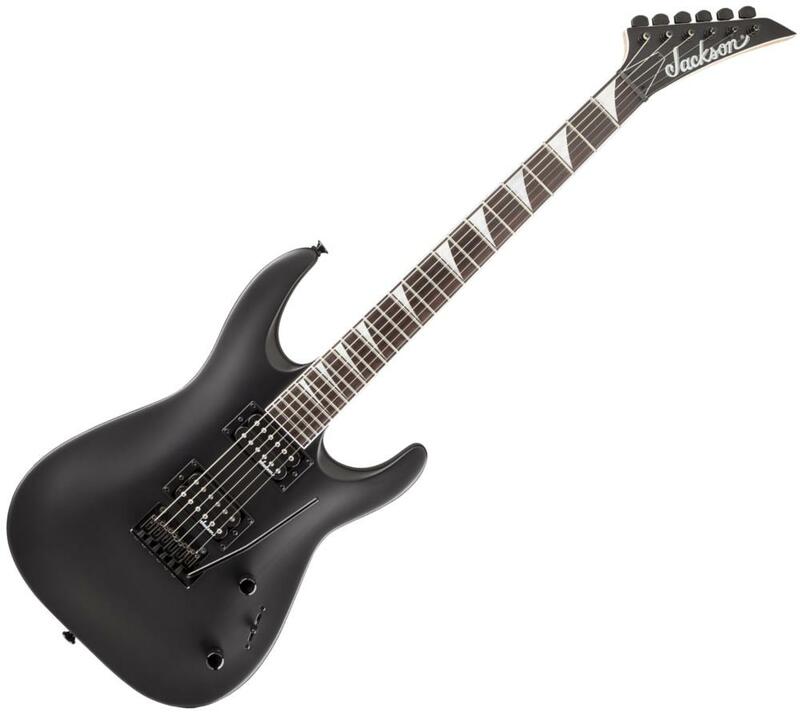 Other well-known brands that have guitars in this price range include ESP, Jackson, Dean, Washburn and more. There are two main basic types of pickups for electric guitars, Single Coil and Humbucking (double coil). The most practical difference is that single coils tend to sound crisp and bright while humbuckers tend to sound warmer (for more information see Seymour Duncan's detailed explanation). An electric guitar can have any combination of the two types and the combination on a guitar is described using the first letter of the pickup type in order from the one closest to the bridge. For example a classic stratocaster will be described as SSS meaning all three pickups are single coil. A more recent development is the HSS strat which means it has a Humbucker at the bridge with two Single coils. I've put the pickup configuration of each guitar below in brackets after the model name so you can easily see which pickups each guitar has and in what positing they are. There are other pickup types out there, like the P90, Filtertron, Rail etc - but they are usually found on guitars that are well above the price range this guide covers, but you can find some of them in our guitar to Electric Guitars between $200 and $500. Since affordable guitars are designed for students, manufacturers know that playability is of utmost priority. This is the reason why many of these budget-friendly guitars don't stray from familiar neck and body measurements. This ensures that they feel as close to premium guitars as possible, albeit utilizing more cost effective materials and production methods. While many of them will satisfy players out of the box, it is unfair to expect these guitars to play like a dream, especially when considering their price. While not always required, it is recommended to have every guitar checked and set up by an experienced guitarist or technician, so you can make full use of its potential. This is essentially the distance measured between the saddle and the nut, or more accurately described as double the distance from the nut to the 12th fret plus some "compensation" added by the position of the saddle. A longer scale length requires higher tension in the strings and results in a brighter tone. A more detailed explanation with examples is presented quite well by Stewart MacDonald and a good description of the implications of different scale lengths can be found on Guitar Player. Guitars based on Stratocaster and Telecaster designs usually have a longer 25.5" scale while Les Paul and SG style guitars are characterized by a shorter 24.75". To make this guide as useful as possible for the purpose stated above, we've selected a strict set of criteria that ensures it covers the most widely available guitars that you will be able to easily find at online retailers and which have a good chance of being available from local stores as well. Must have been widely available from major American music gear stores. We looked at all of the guitars that met the criteria above and ended up with an initial list of 23 guitars, you can find most of those guitars listed here. This entailed analyzing over 8500 related reviews and ratings, including the most recent ones up to March of 2019. That data was then processed via the Gearank algorithm, resulting in scores which we used to rank the guitars according to pickup configuration. For more information about this process please read How Gearank Works. Submitted by Jason Horton on Nov. 16, 2017. Submitted by bo moats (not verified) on Apr. 28, 2018. Submitted by Swapan Pal (not verified) on May. 2, 2018. I want a double neck steel guitar with double pick up and humbucking for playing with a steel or bar. Submitted by Jason Horton on May. 2, 2018. We haven't provided any guides or done any research on Lap Steel Guitars here at Gearank.com so we can't help you with any advice on that one. Submitted by Jason Horton on Apr. 3, 2019.